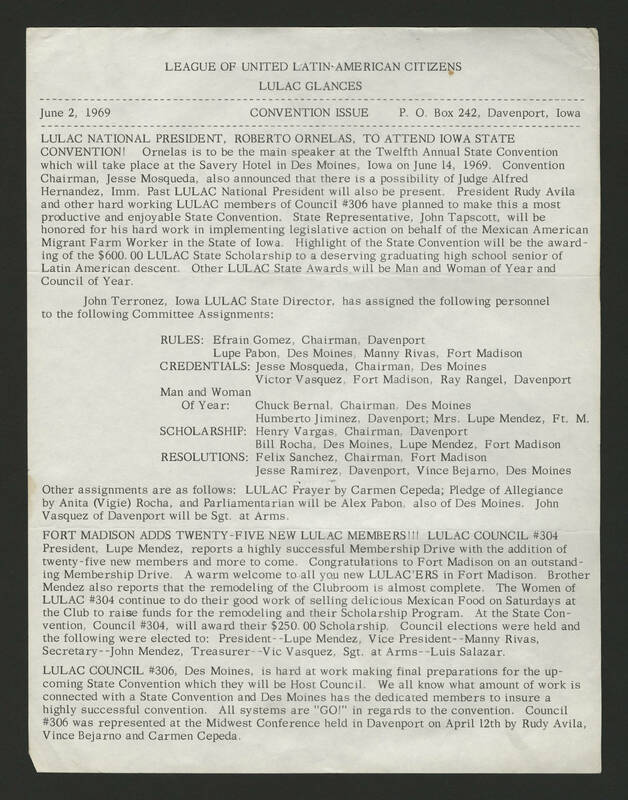 LEAGUE OF UNITED LATIN-AMERICAN CITIZENS LULAC GLANCES June 2, 1969 COVENTION ISSUE P.O. Box 242, Davenport, Iowa. LULAC NATIONAL PRESIDENT, ROBERTO ORNELAS, TO ATTEND IOWA STATE CONVENTION! Ornelas is to e the main speaker at the Twelfth Annual State Convention which will take place at the Savery Hotel in Des Moines, Iowa on June 14, 1969. Convention Chairman, Jesse Mosqueda, also announced that there is a possibility of Judge Alfred Hernandez, Imm. Past LULAC National President will also be present. President Rudy Avila and other hard working LULAC members of Council #306 have planned to make this a most productive and enjoyable State Convention. State Representative, John Tapscott, will be honored for his hard work in implementing legislative action on behalf of the Mexican American Migrant Farm Worker in the State of Iowa. Highlight of the State Convention will be awarding the $600.00 LULAC State Scholarship to a deserving graduating high school senior of Latin American descent. Other LULAC State Awards will be Man and Woman of Year and Council of Year. John Terronez, Iowa LULAC State Director, has assigned the following personnel to the following Committee Assigments: RULES: Efrain Gomez, Chairman, Davenport, Lupe Pabon, Des Moines, Manny Rivas , Fort Madison. CREDENTIALS: Jesse Mosqueda, Chairman, Des Moines, Victor Vasquez, Fort Madison, Ray Rangel, Davenport Man and Woman Of Year: Chuck Bernal, Chairman, Des Moines, Humberto Jiminez, Davenport ; Mrs Lupe Mendez Ft. M. SCHOLARSHIP: Henry Vargas, Chairman Davenport, Bill Rocha, Des Moines, Lupe Mendez, Fort Madison. RESOLUTIONS: Felix Sanchez, Chairman, Fort Madison, Jesse Ramirez, Davenport, Vince Bejarno, Des Moines. Other assignments are as follows: LULAC Prayer by Carmen Cepeda ; Pledge of Allegiance by Anita (Vigie) Rocha and Parliamentarian will be Alex Pabon, also of Des Moines, John Vasquez of Daveport will be Sgt. at Arms. FORT MADISON ADDS TWENTY-FIVE NEW LULAC MEMBERS !!! LULAC COUNCIL #304. President, Lupe Medez, reports a highly successful Membership Drive with addition of twenty-five members and more to come. Congratulations to Fort Madison on an outstanding Membership Drive. A warm welcome to all you new LULAC'ERS in Fort Madison. Brother Mendez also reports that the remodeling of the Clubroom is almost complete. The Women of LULAC #304 continue to do their good work of selling delicious Mexican Food on Saturdays at the Club to raise funds for the remodeling and their Scholarship Program. At the State Convention, Council #304, will award their $250.00 Scholarship. Council elections were held and the following were elected to: President -- Lupe Mendez, Vice Presideent -- Manny Rivas, Secretary -- John Mendez, Treasurer -- Vic Vasquez, Sgt, at Arms -- Luis Salazar. LULAC COUNCIL #306 Des Moines, is hard at work making final preparations for the upcoming State Convention which they will be Host Council. We all know what the amount of work is connected with a State Convention and Des Moines has the dedicated members to insure a highly successful convention. All systems are "GO!" in regards to the convention. Council #306 was represented at the Midwest Conference held in Davenport on April 12th by Rudy Avila, Vince Bejarno and Carmen Cepeda.